DEXP Z455 is one of the new kids on the block that should be noticed because it is a 4G Android device below $100 USD. It comes with excellent display parameters and screen size that is just okay for every kind of user. At the performance and battery level, this device also seeks to satisfy the quest of users. At the camera department, users are in love with the interpolated cameras it comes with. Here below are the full specifications of DEXP Z455 in matters such as price, performance, camera, network, battery and more features. Primary design material in this device is plastic and dimensions are 146.5 x 70 x 10 mm. It weighs 180 grams. The smartphone comes in black and gold colors. It is not a water resistant device, but has fingerprint sensor, and also does not have face recognition technology. Display type is IPS LCD capacitive multi-touch screen, which arrives without a secondary display. The display screen size is 5.45 inches, pixel density is 295 ppi, and pixel resolution is 1440 x 720. Further, display colors are 16 million. 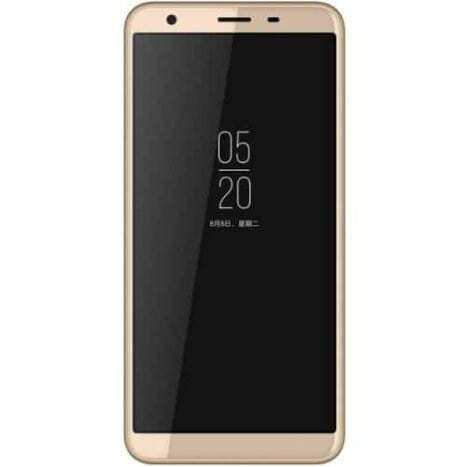 Other features include 18:9 aspect ratio, 75 percent screen to body ratio, 2.5D curved glass, scratchproof screen, oleophobic coating, etc. There is dual primary camera of 8 MP to the rear interpolated to 13 MP with another 0.3 MP, which comes with LED flash. Also, to the front, the camera is 2 MP interpolated to 5 MP. The front camera, made for selfies is also accompanied by a LED flash option. Accordingly, video performance is 1080p@30fps. In a similar way, other salient features of the cameras are geotagging, touch focus, face detection, panorama, HDR, auto focus, and more. Android OS v8.1 Oreo Go Edition comes with DEXP Z455. Surely, it must be able to upgrade to the latest Android if need be later. Further, MediaTek MT6580M accompanies it, together with process technology 28nm and 32-bit architecture. The CPU is a simple component of 1.3 GHz Quad-core Cortex A7, while the GPU is Mali 400 MP2. There is internal memory 1GB of RAM that cannot be increased. However, the 8GB of ROM can be increased up to 32GB external storage with a micro-SD card. Sensors are accelerometer, proximity, and light. DEXP Z455 is a 4G Android phone which means that it can operate on GSM, HSPA and LTE networks. In other words, 2G, 3G, and 4G are in the smartphone. Also, there are two nano/hybrid SIM card slots in the device. Other salient components are Bluetooth v4.2, Wi-Fi, mobile hotspot, GPS, A-GPS, GLONASS, headphone jack, and micro USB 2.0. However, there is no HDMI, NFC, or infrared in the DEXP Z455. Powering the device is a Li-Ion 3400 mAh non-removable battery which has neither wireless charging nor fast charging technology. Standby time and talk time for the DEXP Z455 are 300 hours and 22 hours respectively. DEXP Z455 price is stated to be $98 USD. Price may differ from country to country. As regards availability, the smartphone is now in the market having been released a few days ago.